There’s a reason why March 11-17 was designated “World Salt Awareness Week:” too much salt has been linked indisputably to hypertension. And hypertension can lead to potentially life-threatening heart attacks. Lowering salt intake is a relatively easy thing to do and yet, most of us consume too much by virtue of the foods we eat. One study performed at Imperial College London in the U.K. laid out this tendency to buy and eat salty foods all too clearly. 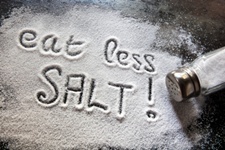 The British researchers looked at data from around the world and found that for most of the human population, sodium intake is still over and above the recommended daily intake of about 2,300 milligrams or less per day (approximately one teaspoon). PLUS: Why high blood pressure has become the number one risk for death. Clearly, we all need to keep monitoring our sodium intake. When you consume too much salt, you risk pushing your blood pressure too high. And unfortunately, you might not even know it—that is the danger. Hypertension is called the “silent killer” because it often triggers no symptoms to warn you that something is wrong. If you find it too tedious to check the small print on the labels of foods you buy at the grocery store, look for products that are labeled “low-sodium.” Do what you can to stay away from those prepared foods that you know are high in sodium, such as processed meats, salted chips, certain breads and cereals, and most condiments. Also, take note of the fact that restaurant meals can be a hidden source of high levels of sodium. Some meals have a lot of salt added because chefs know that our taste-buds respond positively to it—salty food just seems to taste better. If you’re eating out, know that Chinese, Thai, Japanese, and fast food North American restaurants are all likely to serve food high in sodium. The best health advice is to limit your intake of these meals. Brown, I.J., et al., “Salt intakes around the world: implications for public health,” Int J Epidemiol. June 2009; 38(3): 791-813.Anderson, C.A., et al., “Dietary sources of sodium in China, Japan, the United Kingdom, and the United States, women and men aged 40 to 59 years: the INTERMAP study,” J Am Diet Assoc. May 2010; 110(5): 736-45.